The Kalem Club was one of the great literary partnerships in American literature. Taking shape even before H.P. Lovecraft arrived in Brooklyn in 1924, the group featured some of the most distinctive figures of their day: George Kirk, genial bookseller and collector; Rheinhart Kleiner, a worldly versifier and man about town; Samuel Loveman, exquisitely refined poet and friend of Hart Crane; James F. Morton, devotee of freethought, the single tax, and Esperanto; Everett McNeil, prolific writer of historical novels for boys; Frank Belknap Long, poet, aesthete, and writer of weird fiction; and, of course, H.P. Lovecraft, on the threshold of becoming the 20th-century Poe. As chronicled in largely unpublished letters by George Kirk to his fiancée, the Kalem Club comes alive as never before—gathering for weekly sessions, taking long, leisurely strolls throughout the New York area, and sharing their works-in-progress. 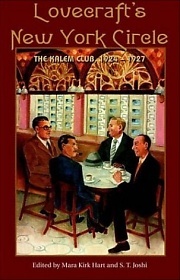 In the second half of this book, an abundance of writings by the Kalems—poems, essays, excerpts from treatises and novels—allows readers to grasp at first hand why the Kalem Club has left an indelible mark upon the literature of its time. Lovecraft’s New York Circle has been compiled by Mara Kirk Hart, daughter of George Kirk and a longtime student of Lovecraft and the Kalem Club, and by S.T. Joshi, a leading authority on Lovecraft. To His Peculiar Friend, G. Kirk, Esq. Two Christmas Poems to G.W.K. Lovecraft’s New York Circle: The Kalem Club, 1924–1927. Edited by Mara Kirk Hart and S.T. Joshi. New York, NY: Hippocampus Press; 2006; ISBN 0-9761592-9-5 (softcover); 240 pages.